Age before beauty -- an old adage that does not apply in Hollywood (have you seen Mickey Rourke? ), but one that apparently does apply when it comes to architecture. 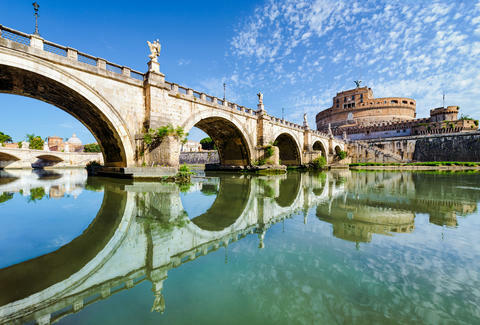 So say voters, anyway, who've chosen Rome as the most beautiful city in the world. Travel authority Rough Guides tallied votes from readers over Facebook and Twitter to determine the 14 most picturesque metropoles on the planet. Though the ranking doesn't mention anything about Rome's forthcoming red light district, it nevertheless found the Eternal City as no. 1 based on its stunning buildings, piazzas, and art. Florence landed in second place in the poll, thanks to the Duomo and Michaelangelo's David, while Paris came in third because it's Paris, and everybody loves that place. And while the UK, Spain, and Australia had two cities on the list apiece, Italy unanimously won the global beauty contest, with Venice also cracking the top 10 at no. 7. Though the majority of cities featured are in Europe, urban centers in Japan, Brazil, Australia, and Canada (yep, even Canada) appeared in the ranking. Sadly no American city registered. Not even Fresno. Chloe Pantazi is an editorial assistant on Thrillist's travel team. She has never been to Rome, but she used to live in the fifth most beautiful city in the world, and is visiting the sixth this spring. Follow her on Twitter at @ChloePantazi.